A Simple game of color matching made for Winnitron for 1-4 Players! Or at home with 1-4 people cramped around your tiny keyboard, good luck! 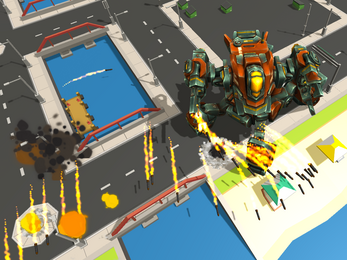 Crash landing on Earth, smash around a city in a giant mech. An early prototype made for the Winnipeg Game Jam (Peg Jam) 2016 for the theme "There Goes The Neighborhood". Boomtown needs to be demolished, and they're trusting you, a bowling ball, to do the job! Destroy the town, and get as many points as you can within the time limit! Fill up your rampage meter and detonate! Charge up and go BALListic! Can you pass through this short and simple platformer? You may have 100 lives but would it be enough is another matter. This is a blended multiplayer game. that blends traditional gaming aspects with VR experiences. It's a collection of mini games that pit the player in VR against 1-3 other players on the computer all based around the central story of experiments gone wrong. Grampa's had enough of the Frat Boys, and it's time for his revenge. Music composed for entries for the 2016 Winnipeg Game Jam, June 17-19th in Winnipeg, Manitoba.